It's hard for me to care much about the details of the proposed fiscal year 2015 budget just released by the White House, because no one else seems to care much, either. Indeed, the focus on short-term budget issues is causing us to lose focus on the fact that U.S. government borrowing is on an unsustainable long-run path. Under the Congressional Budget Act of 1974, the President is required to submit a budget to Congress by the first Monday in February. This year's proposed budget arrived the first Tuesday in March. President Obama's Office of Management has now missed the legally mandated timeline four of the last five years. This delay might seem to make it harder for Congress to meet its own legislatively required deadlines, except that the chair of the Senate Budget Committee, Patty Murray, has already announced that the Senate won't take up a budget this year--and indeed, the Senate hasn't passed a budget at all in four of the last five years. Murray says that the Senate will rely on the spending limits over the next two years that were in the bipartisan deal enacted by Congress and signed into law by President Obama. However, the Obama budget proposes breaking those same spending limits. Rather than agonizing over fine-print details of budget proposals, I'm more likely to head for the "Historical Tables of the U.S. Budget," a highly useful resource for looking at long-run trends, and for the "Analytical Perspectives" volume of the budget, which breaks down issues like tax expenditures, infrastructure spending, and others. But unlike in years past, these volumes apparently weren't ready to be released with the rest of the already-late budget earlier this week, and are supposed to be published next week. All of this just illustrates a theme that is already apparent to anyone who watched politics: the process for producing a federal budget is broken. Alan J. Auerbach and William G. Gale offer a reminder of why this matters in "Forgotten but Not Gone: The Long-Term Fiscal Imbalance." To set the stage for their discussion, here are two figures from a report last month from the Congressional Budget Office. The first shows budget deficits as a percentage of GDP over time. 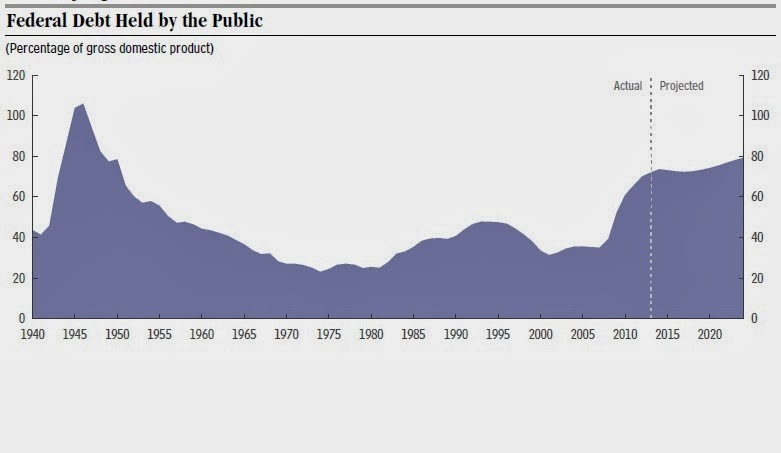 The second shows the accumulated federal debt owed to the public as a share of GDP over time. depend very much on one’s choice of forecasts, in particular regarding the growth in health care spending. Nevertheless, under the most optimistic of the health care spending scenarios we employ, the debt-GDP ratio will rise to 100 percent in 2032 and 200 percent by 2054 and then continue to increase after that. All told, to keep the 2040 debt-GDP ratio at its current level, 72 percent, in 2040, would require immediate and permanent policy adjustments – reductions in spending or increases in taxes – of 1.9 percent of GDP under current policy. To keep the ratio at its current level through 2089 would require immediate and permanent adjustments of about 3.5 percent of GDP. disruptive the eventual policy solutions will need to be ... Policy makers certainly may not want to reduce spending or raise taxes during a weak period for the economy, but that is different from not planning ahead." For past blog posts on the economic costs of large budget deficits, see here and here.